I inherited a painting from a Rich uncle. He was the inventor of liquid hand soaps. He got this painting back in the 1970s or 1980s and it was not cheap. I've been trying to get it appraised but have had very little luck. I believe this painting is worth at least $150,000 USD. It may be Chinese or Japanese. I believe it is an original work I have not seen any copies nor am I able to make out the stamps of who owns the rights to it. I'm sure the rights will be expensive and you can't make a copy without the original. Do you know any auction houses that sell expensive art works that you could connect me to? I will not part with this painting for less than 1 million RMB. The money will be used to start an international business. I am attached to this painting. I would possibly buy it back if my business is successful. Hopefully the rights to copy it are not cheaper then $90,000 USD when you possess the original. 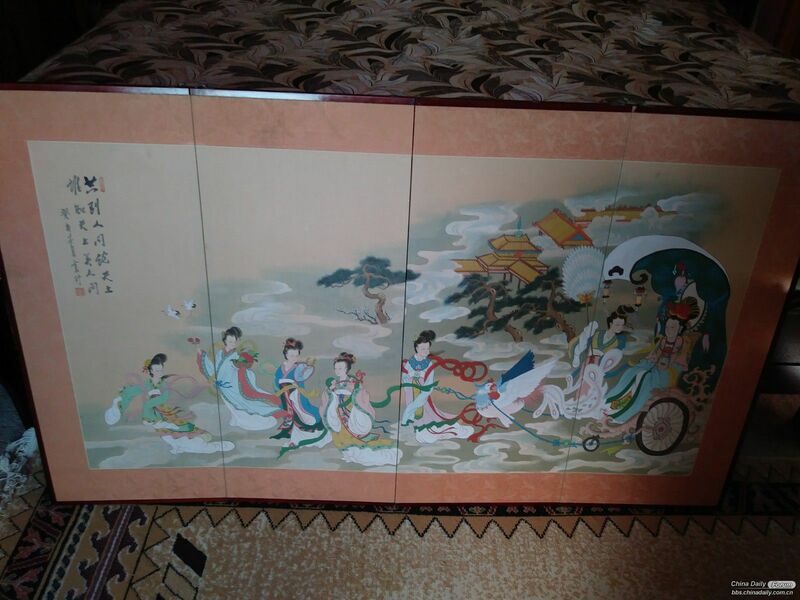 I wanted to pay someone to translate this painting, but everyone I contacted for a translation both Japanese and Chinese can not read it. Why don't you just take it to an art appraiser? Then you can wash your hands of it .. or use some of your rich uncle's liquid soap. I am trying to take it to several appraisers. I'm hoping someone on this forum knows a chinese art appraisal company. I just translated the poem. 共在人间说天上,不知天上忆人间 :: heaven and earth in the world, I do not know the world recalled the earth.